After the horrendous disappointment of the miniature Mario Kart, I was really encouraged by what I saw in this much larger "1/12th scale" version (I use quotes because it's actually more like 1/5th scale at almost one foot long). The quality is great, and the materials are much better. The wheels have soft rubber strips for traction. 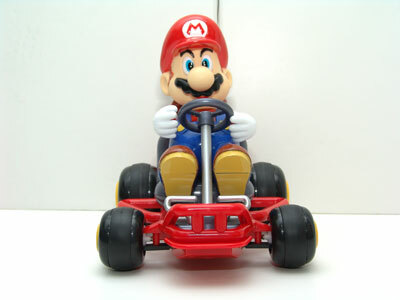 Mario's head is made from a softer material and looks realistic (in a cartoon sort of way) and both the head and arms are poseable. Most importantly, the wheels can steer both ways as this is a truly full-function RC, unlike the smaller version! Getting batteries in the car and controller is easy, but looking at that controller! 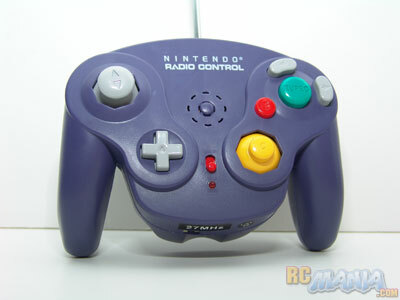 It's modelled after the Nintendo GameCube Wireless controller and is one of the most interesting I've seen on any RC. On the upper left is your basic forward/backward control. On the upper right, the two gray buttons are for turning. The green button is Turbo. The others are all sound effects! The sounds are taken right from the game and include "Mama mia!" and "Let's Go" but they're really crackly and hard to hear. A fun touch, though. 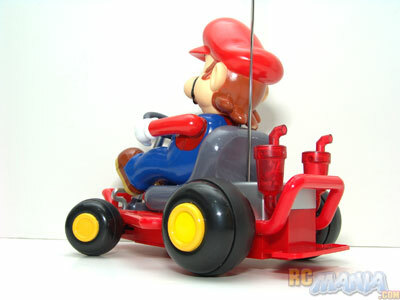 When it gets running, the Mario Kart is a lot of fun! It handles nicely and looks great. An interesting thing I learned is that turbo will not work while you're turning. I thought this was a drag at first, but it actually made it more fun because it means you can't just stay on Turbo all the time for the highest speed. You have to line up your straightaway shots first before hitting the Turbo to really boost forward. It works better than the Turbo system on any other RC I've tested, because on those Turbo is basically the only thing you use, as if it was the only forward speed. 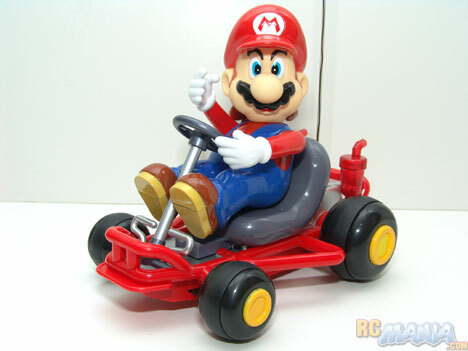 The miniature, 1-channel cheap Mario Kart was a bust, but this bigger one is great. It looks good, the controller is fun, and it drives well. Better still, you can also get a Yoshi or Donkey Kong version with a 49mhz for one-on-one racing which would surely be a blast! The only thing I could ask for is a bit more speed, but overall this is a really good buy.